I made sous vide-style “poached eggs” for the third or fourth time over the weekend and have had a revelation: eggs this way (which are actually very softly soft boiled) are sort of gross, and definitely not worth the time. While I'm not a Creationist, eggs seem almost tailor-made by some higher power to be ideal for poaching. 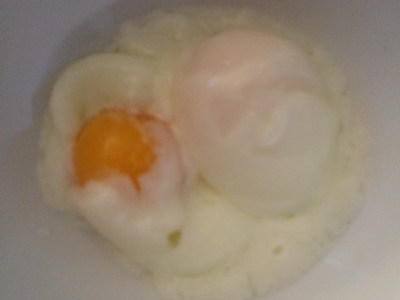 The proteins in the white require a higher temperature to set than the proteins in the yolk, so cooking at a high heat from outside to inside works really well--pay attention to timing, and the egg takes care of itself. But sous vide-ing them messes with this miracle of food. Cooking at all one temperature--the right temperature to make a great yolk--ensures that the whites stay liquid and, by my standards, kind of nasty. I have a buddy who says I'm wrong, that using ChefSteps's exhaustively researched egg calculator will yield the poached perfection I'm missing today. But look at SeriousEats, which I highly respect, but which says the best way to get a sous vide poached egg is to sous vide it, and then poach it. Contrast that with Alton Brown’s recipe for perfect poached eggs, which highlights and celebrates the miracle: foolproof, five minutes, and the eggs are truly perfect (by my definition of perfection), with firm whites and soft gooshy golden yolks. I guess if I had to make a bunch of poached-style eggs for a recipe, maybe whipping out the immersion circulator would be justified. But, lesson learned, I’m going to stick to the old-fashioned way if I’m poaching some eggs for a weekend benedict for one.